DANE LOVETT is a contemporary artist based in Melbourne. This body of work continues his exploration into the still life genre by repetitively citing motifs from art history, as well as his own oeuvre. Rendered in a strikingly restrictive palette of dark purple and warm blues, the series is unified by a seductive, yet inescapable feeling of twilight. 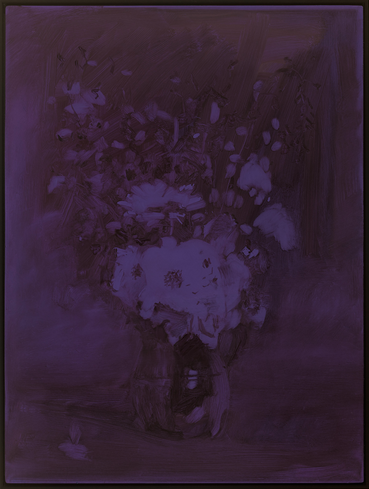 Produced using a subtractive method of painting, whereby areas of deep transparent colour is removed to reveal the purple base, each gesture revisits the subject matter with a sense of casual reminiscence. Lovett recently completed a Masters of Fine Art by Research from the Victorian College of Art, University of Melbourne (2016). Recent exhibitions include Nightshades, Sullivan+Strumpf, Sydney 2017 and Club Moss, STATION, Melbourne 2016. He was awarded an Australia Council Tokyo Studio residency in 2011, the Royal Bank of Scotland Emerging Art Prize in 2010, and his work is held a number of public and private collections including the Art Gallery of NSW. Dane is represented by STATION Gallery, Melbourne and Sullivan+Strumpf Gallery, Sydney. Welcome back to Nite Art. Collaborations are central to our program, bringing the voices of artists, galleries, museums, curators, collectives and small organisations together. In 2018 Nite Art seeks to deepen the relationship and experience for audiences and artists over time, through a series of programs throughout the year. We continue to play an important role in mapping, connecting and creating easy access for broader audiences, to art and artists in our city. This year we are extending our boundaries. Creating new alliances and experiences to share. Capturing new ideas and works in progress. Our first program for 2018 SPACE WALKS and Artist studio visits have launched. Up late, Nite Art invites you to the Grainger Museum in a celebration of the pioneers of Melbourne’s experimental electronic musical scene. Join us on the 23rd of August for ‘Current Transmissions: David Chesworth and OK EG’, a collaboration between the Grainger Museum, Liquid Architecture, MESS Ltd and Nite Art. Visit our Talks Walks page for details, follow our instagram for updates and make a date with art. Come explore, share, discover. Join us, bring a friend, bring a crew, Melbourne art wants you. See Nite Art 17 One city, 6pm to late, 50+ artists, from Melbourne University to Flinders Lane, and back. Artists, installations, painting, drawing, video, sculpture, film, photography, meet walks, lectures, galleries, openings. We acknowledge the Wurundjeri people of the Kulin Nation as the Traditional Custodians of the land on which we meet and walk and offer our respect to Elders both past and present.